It is. And what have I done? Two big items: 1) I sent a query off to an agent. and 2) I’ve started my Oklahoma project. On top of that, two small items: 1) I’ve finished 9 of the 50 books for the 2015 Reading Challenge. 2) I’ve started this semester’s teaching. The query is my latest fantasy project, sent to an agent who responded positively to some earlier work of mine. It’s a bit like sending one’s child off to the first day of school, except that I’ll have to wait a bit longer than a few hours to find out how it went. It could take as long as 3 months NOT to hear from this agent, at which point I query the next person on my list. I know it would be more efficient to double, triple, or even quadruple my queries, but if my second choice person expressed interest before my first choice had responded, I’d be in a quandary. The new project will take my mind off of waiting to hear from the agent. Picture this: a small town in 1960s northeast Oklahoma, with a “downtown” area comprising a few stores along one street. It’s just a few miles from “out in the country” that includes a dam-formed lake. Here our hero decides he will travel no more and sets out to get his mom to settle. I don’t yet know how he does this, nor even why his mother is constantly on the move, but I trust I’ll discover these as I write. Synchronicity? Coincidence? Homage? Or something more sinister? Probably not the latter, since Forché was at the ceremony announcing finalists for the 2010 National Book Critics Circle Awards, a list which included Egan’s novel. And it’s a perfect simile: ears do look like dried halves of apricots or peaches! Yet the overlap troubles me. As a writer, I worry all the time about the extent to which other authors influence my ideas. I read because I enjoy it, but also, now, to see how other writers handle plot and character and dialog. Of course I want to be original; the “anxiety of influence” isn’t something felt only by poets. So. I take a deep breath. I go back to my writing, attentive to echoes that warn me of getting too close to someone else’s style or plot or creation. Also, I take great solace in thinking about musical composition. There are only 8 notes in a scale (12 if you count the flats and sharps in between). Yet there seems to be an infinite universe of possible melodies. With the entire English lexicon at my disposal, I ought to be able to manage this. 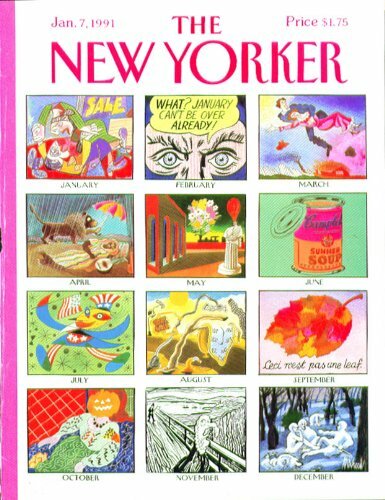 Three days later: These are my best guesses about the artists parodied in the calendar, in order from January to December: Picasso, Lichtenstein, Chagall, Rousseau, de Chirico, Warhol, Miro, Dali, Magritte, Matisse, Munch, Manet. So many whose names start with M! If I’ve misidentified any of these, please let me know. This entry was posted in Am writing, reading. Bookmark the permalink. Witty New Yorker cover, though there were one ror two homages I couldn’t quite place. Good luck with your publisher pitch — perhaps the calendar month images relate to the responses, though hopefully all it takes is one response, the right one. Conscious copying is easier to avoid than unconscious. Take heart from the anecdote I heard about the prolific tunesmith Schubert who plagaiarised his own melodies without realising till it was pointed out. Anyway, it’s almost impossible to be completely original except in the conjoining of two or more pre-existing concepts. Or so I believe. Thanks for the Schubert story. Heartening indeed! I always tell myself that if there are really only 7 plot-lines, there’s always going to be a certain amount of stealing — which some call the sincerest form of flattery. No, just see it spending your literary inheritance wisely, never stealing — after all, if The Lion King can ‘steal’ the plot of Hamlet why isn’t everything up for grabs. Now, Hamlet plus the African plains, that’s originality! Also, Chris, I added a paragraph at the end of the post identifying the artists. Chagall and Miro might be wrong, but I think the others are correct. Ah, Miro, didn’t place that, and the Manet — was completely misdirected by the pumpkin head. The rest I guessed, though the ‘Chagall’ at first confused me with the garish ice-cream flavours. Thanks for posting this though! Keep in mind — I could be wrong about some of these. I initially though Kandinsky instead of Miro, but looking at samples of the two artists’ work convinced me it was the latter.